Brooklyn-based duo Great Good Fine Ok, Jon Sandler and Luke Moellman, makes synth-pop tunes as interesting as their style. It’s a wonder that between working on their debut EP III and collaborating with bands like The Chainsmokers, Sandler finds time to curate his impressive kimono collection. 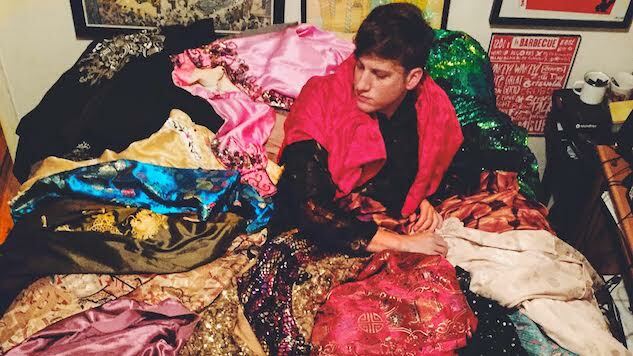 But for their current tour, celebrating the new EP, he packed over 30 kimonos. Sandler sat down with Paste to discuss Chinatown knock-offs, Wes Anderson and, of course, kimonos. Paste: Were you always interested in fashion or is that a more recent development? Jon Sandler: I’ve always been into fashion. Even as a child, I enjoyed shopping for weird stuff and putting together unique outfits. I remember showing up for middle school one day wearing this extremely elaborate fake Versace shirt with huge gold buttons that I bought in Chinatown for $15 on a recent trip to NYC. Paste: How do you dress in your day-to-day life as opposed to when you’re performing on stage? Sandler: As much as I would love to wear Kimonos, sparkly pants and LED shoes everyday, I’m not trying to bring that much attention to myself. I love those things as the visual representation of the music. The shows are so dynamic and colorful—I’ve always wanted to complement that with our fashion. In my everyday life, I do wear interesting things. I have a plethora of “everyday jackets” that for most people would be the craziest things they own. I’ve always seen clothing as art and a way to express yourself, rather than just functional body coverings. Paste: What’s one of the biggest fashion “mistakes” you’ve made in the past (a bad trend, for example)? Sandler: I used to wear clothing that was way too big. I guess that was the style in the 90s, but I remember having to buy all new stuff because everything I owned was “baggy.” Remember when people used to want their clothes “baggy”?! Paste: What movie, music video or TV show had the most iconic fashion for you? I am inspired by pretty much every single Michael Jackson or Prince music video… and the fashion in Boys II Men videos… WOW. Wes Anderson movies are always on point as well. Sandler:The way people dress has always been influenced by the culture of a certain place at a certain time, and can be an amazing way to look back and learn about what was happening on a historic and societal level. It is an important form of self expression and a powerful way to communicate who you are and what you represent, sometimes unintentionally. Paste: How does fashion relate to music? Sandler: As I mentioned, I think fashion can be an impactful visual representation of the music being made. Like most artists, I am not only creative when it comes to writing songs and making music. When you are someone who is driven to represent yourself creatively, it seeps out in many other ways. I also love to paint, draw, write stories, act, dance, etc. Luke loves photography, graphic design, etc. If we agree that fashion is a form of art, it makes sense that generally speaking, artists of any kind would gravitate towards being expressive in that way. Especially in music, particularly pop music, where there is usually an image/show/performance aspect, fashion becomes a distinguishing and significant factor. Paste: What do you read (magazines, Instagram feeds, whatever) to keep up on fashion? Sandler:I definitely get a sense for what’s “in style” by staying up to date on pop culture—watching late night shows, reading Rolling Stone, etc. However, I don’t like to be influenced too much by what “people are wearing.” I prefer to stay ahead of it by going with my own instinct. I can’t tell you how many times people have texted to inform me that a celebrity is “stealing my style.” I definitely don’t think I am any sort of groundbreaking fashion icon, or an authority on fashion in any way, but I’ve never been interested in following trends. Paste: How do you approach styling for something like a music video? Sandler: It all depends on the concept. I love music videos where the style is exactly on brand with the artist, and I also think it can be a cool platform to do the opposite of what people expect. An opportunity to experiment or play a role in order to execute a certain idea, make a specific point or get a specific reaction.